Geo­da­ta is blow­ing up like crazy. As of last year, more than 680,000 apps in the Apple store were using loca­tion ser­vices to pin­point users and serve up site-spe­cif­ic direc­tions or restau­rant rec­om­men­da­tions (just to name two obvi­ous exam­ples). Enti­ties from city gov­ern­ments to human rights groups are upload­ing tor­rents of loca­tion data on every­thing from fruit trees to drone strikes. Wran­gling all that geo­da­ta and turn­ing into some­thing use­ful is a huge chal​lenge​.New web-based soft­ware from Map­box aims to help. The DC and San Fran­cis­co-based com­pa­ny has been work­ing for more than a year to over­haul its Map­box Stu­dio soft­ware. Its intend­ed audi­ence is devel­op­ers and “super pow­er­ful high-end car­tog­ra­phers,” says CEO Eric Gun­der­sen. But you don’t have to belong to some elite car­to­graph­ic strike force to use it. It has a graph­ic inter­face that’s fair­ly easy to nav­i­gate, espe­cial­ly for peo­ple famil­iar with pro­grams like Illus­tra­tor or Pho­to­shop. The idea, Gun­der­sen says, was to cre­ate a pow­er­ful map­mak­ing tool for the pros that’s also acces­si­ble for the map­mak­ing mass­es. That’s no small thing. In the past few years, map­mak­ing soft­ware has got­ten way more acces­si­ble. But most of the offer­ings, includ­ing those from Map­box, were either pret­ty lim­it­ed in what they could do or required you to do some cod­ing to cus­tomize your maps. If you want­ed to change a font, say, or the size of an icon, you’d have to code it in a text edi­tor win­dow. No cod­ing is required to use the new ver­sion of Stu­dio. It’s all online and the inter­face is point and click. Menus let you select a base map and add lay­ers of data, most­ly from open sources like Open Street Map and the US Geo­log­i­cal Sur­vey, or upload your own dataset. You can choose which fea­tures appear and dis­ap­pear at dif­fer­ent zoom lev­els, and slid­er bars allow you to cus­tomize col­ors, line widths, and the like. These are all impor­tant car­to­graph­ic design con­sid­er­a­tions, and Stu­dio was designed to nudge you toward good deci­sions. The goal was to cre­ate some­thing equal­ly use­ful for tech devel­op­ers who have no idea how to design and design­ers who have no idea how to code, Gun­der­sen says. There’s also an inter­est­ing “x-ray mode” for explor­ing your data. 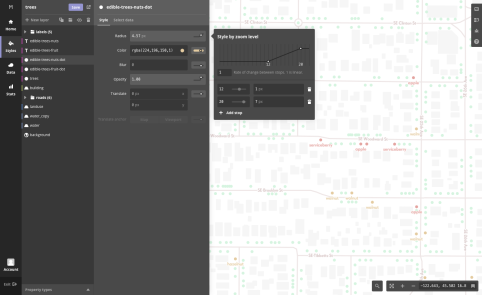 In this mode, the map turns black and you can mouse over it to see the dif­fer­ent kinds of data in a dataset so you can decide what to include and what to leave out of your final map (you might want to hide address­es so they don’t clut­ter your street map with a tan­gle of num­bers, for exam­ple). 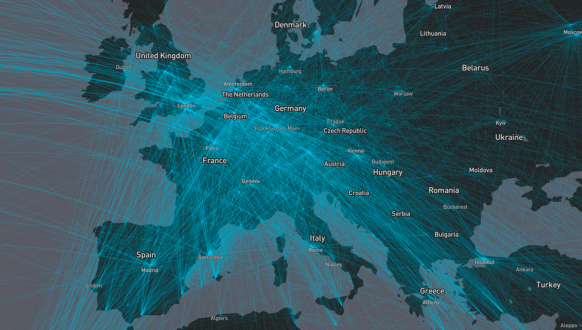 What does this mean for the future of maps? Stu­dio should make it eas­i­er for devel­op­ers to cre­ate more con­text-depen­dent maps, says Map­box design­er Saman Bemel-Ben­rud. That might mean a nav­i­ga­tion app that high­lights stair­ways if you’re look­ing for bike direc­tions (because, you know, it’s hard to ride a bike on stairs), but not when you’re walk­ing or dri­ving. Or it could be a rideshare app that high­lights build­ing foot­prints when you’re stand­ing in the mid­dle of a busy city block so you know exact­ly where stand to wait for your car. Unlike Google, which sells busi­ness­es access to their mas­sive trove of maps, Map­box sells busi­ness­es tools they can use to make their own maps (you can play around for free, but pric­ing scales up with the num­ber of map views and mobile users). Their clients already include Foursquare, Pin­ter­est, Ever­note, and MapQuest (yes, they still exist!). If Stu­dio catch­es on the way they hope, that could be just the begin­ning.